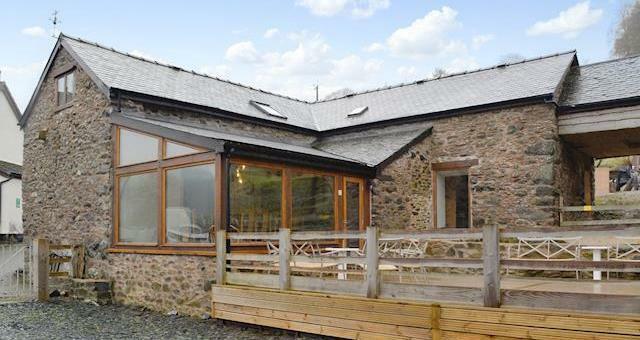 Tanyfoel Holiday Barn is separate and self-contained building within the Tanyfoel Farm boundary. We aimed to keep the barn's timeless features on the outside, but contemporary, comfortable, and cosy on the inside. The main entrance is on the ground floor, into the fitted kitchen with Rangemaster and AEG appliances, and luxury 'leathered' granite surfaces. The copper-look cookware, matching toaster and kettle brings you the very latest in kitchen design. A twelve place dishwasher takes all your crockery, leaving you to enjoy extra time with your friends and family. The adjoining dining room has a stunning double aspect giving views across the Graig Ddu and Alan valleys, no matter where you are seated at the long sturdy oak table. With plenty of room for all twelve persons to be seated, no elbows need to be tucked in to eat the meal. Denby Stoneware crockery with matching serving dishes cater for every occasion and meal. Crystal glass and beautiful stainless steel cutlery compliments the crockery. The lounge is up the spiral staircase, where you'll find a huge leather settee which will easily seat nine plus a few little extra bums. A separate area within the main lounge has been set aside for playing board games or cards, or planning the next days activities. There is also a relaxing reading chair if someone wants to be 'in on the action' but slightly away from the madding crowd! Two bedrooms (one en-suite) and the bunk room are on the ground floor, as is the family shower room with WC, and a separate WC. Two more bedrooms (one en-suite) and a small lounge are up the second staircase. The heating and hot water system is a solar/biomass boiler powering underfloor heating throughout. Guests can adjust the thermostats for their comfort. There are smoke alarms, fire blankets, extinguishers, and fire exits to the satisfaction of local inspectors. The Holiday Barn's utility room is in an outbuilding of the farmhouse, but is for the use of our guests. The utility room has large capacity laundry appliances, and a fridge/freezer "honesty box". We have ample parking onsite, with dedicated guest spaces located so as not to impede the views. 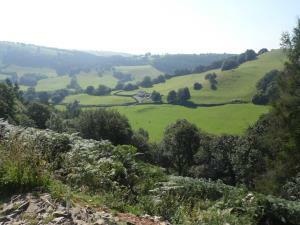 Being a former hill farm, Tanyfoel is on a sloping plot, and the ground can be challenging for the less able.